Make your ideas for concrete patio designs come to life by sketching them on a piece of paper. Your sketch doesn't have to be fancy but it needs to represent your thoughts of a diy concrete patio and how the process of building a concrete patio benefits you. Sketching your ideas will cause you to open your mind to new possibilities and can help you see potential problems that you can think of solving them construction begins. The phrase “a picture is worth a thousand words” is truly magnified when your ideas are on a sketch. Architects and engineers are well known for their creative ideas but their thoughts will never come to reality until they put them on some form of drawings. Building a concrete patio begins with an idea to fulfill a need. For instance, figure 15 began with a need to provide for a disabled person. 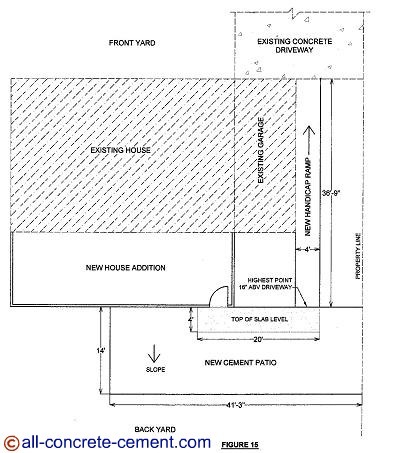 By sketching the idea, it became apparent that the presence of the handicap ramp will interfere with the usage of the cement patio. Also, the handrails at the sides of the handicap ramp will become a burden for any intended use of the patio. Any concrete patio furniture and family activities will will greatly diminished by the presence of handrails. As a solution to the problem, the patio was raised to 16 inches above ground. By putting your thoughts into a sketch, it will open your mind to explore more creative ideas. It also makes you think of potential problems so you can make necessary adjustments prior to construction. A concrete patio design can be as simple as drawing boxes or circles. You can layout your existing house and garage by drawing rectangular boxes to represent them. Smaller boxes can represent your patio, sidewalk, ramp, etc. Enclose your boxes with even a bigger box to represent your property line. Use a tape measure to locate exactly where your patio starts and ends. A good sketch is the best way to get accurate estimates. It also guide your contractor to do exactly what you want. Use figure 15 as guide and proceed with drawing your project. Should you have any questions, do not hesitate to ask and I'll be glad to help.